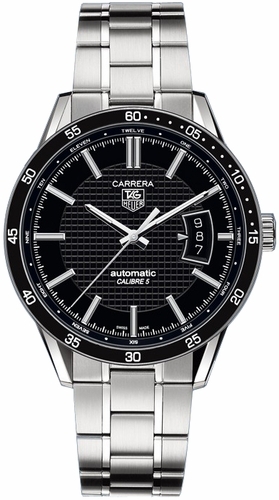 Tag Heuer offers a little extra insight with the WV211M.BA0787, new in the Carrera line. What do I mean by insight? Most who would shell out a grand or more for a wristwatch are already aware that the key to a good watch is good movement. The promise of good movement is a large part of why they are willing to shell out the money for a luxury watch. But for some, the attraction to a good mechanical watch movement, which is one of the specific attractions of Tag Heuer, goes beyond the desire for certainty in timekeeping. For the amateur horologist, the fascination is with the clockwork itself. And why not be interested in it? Small tiny toothed cogs, meticulously designed, manufactured and placed, the magic of hidden weighted rotors and the mystery of escapement mechanisms–the keys of automation in a convenient package you wear on your wrist. But most watches hide that away–aside from some hideously expensive ones that gussy it up and call it a watch-face. With this Carrera, a moments boredom can turn into hours of self-mesmerization as instead of watching time slip by in a waiting room, you take the watch off, and turn it over to observe the movement of the movement through a viewing window. Where most will lock away the magic, Tag Heuer has offered a window to see it happen. Sure beats risking damaging the components by removing the back. It also offers a more gratifying reassurance that all is well than holding the watch up to your ear to listen to the ticking. 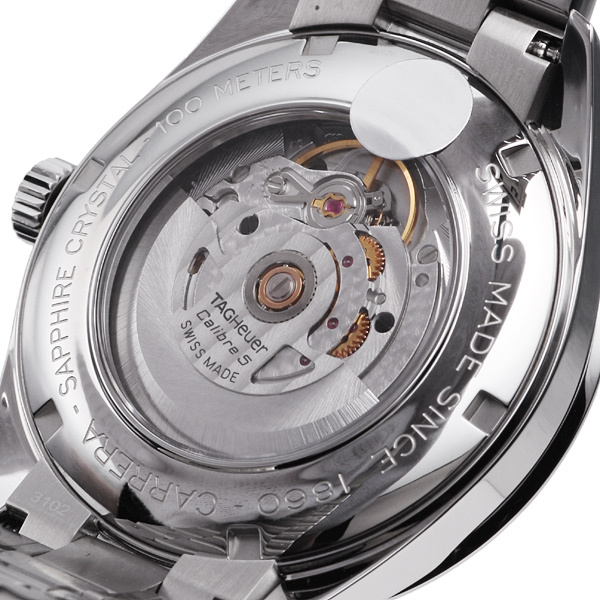 The watch features stainless steel housing, and a stainless steel bracelet. Personally, I would have liked a black leather strap, but they didn’t ask me. The face is large in appearance with numeric minute markers around the bezel in the same luminous white at the stick shaped hour and minute markers on the face. The watch hands are steel with luminous stripes inset. The hands themselves come to a sharp and satisfying point. The watch face itself is black with some texturing on the surface. It has a cutout at three ‘o clock to display the date, as well as the previous date, and tomorrow’s date. I’m not sure why as I’ve personally never had difficulty determining consecutive numbers. Water resistance on this model is only to 50m, so no swimming while wearing.